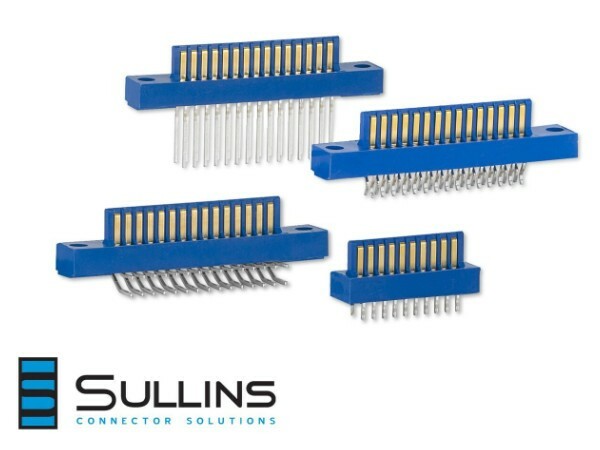 Sullins’ Double-row Male Edgecard Connector series Features 0.100″ or 0.156″ contact centerlines. These edgecards boast gold-plated contacts to ensure performance in high-reliability/high-cycle applications and can be used as sacrificial items to save wear on expensive daughtercards. Sullins Connector Solutions now produce a comprehensive series of male edgecard connectors designed to simulate 0.062″ (1.58 mm) thick daughtercards. The parts provide engineers and assemblers with a durable 0.100″ (2.54 mm) or 0.156″ (3.96) spacing interconnect system when mated with a Sullins or comparable female edgecard. The double-row connectors notably feature phosphor bronze gold-plated contact fingers that can eliminate the need for gold plated fingers on the daughtercard. Supplied in dip solder, straight, or right angle for through hole, and card-extender for straddle mount terminations; they facilitate optimal design flexibility while ensuring robust and reliable connections in high-temperature applications. Materials are UL94V-0 rated. These parts are available with a choice of PBT or Nylon 9T insulators. The series features an operating temperature range of -65 degrees C to +150 degrees C, and a processing temperature of 260 degrees C peak. Contact forces: (per MIL-C-21097C using a 1.58mm steel test blade). Board insertion force: – 16oz. max per contact pair. Board withdrawal force: – 1 oz.min per contact pair. Mechanical operations: – 500 Min. Wire wrap is a registered trademark of Gardner Denver Corp. These male edgecard connectors are ideally suited for use in an array of high-temperature, high-cycle life applications where circuit connection of PCBs or wire harnesses to 0.062″ daughtercards are required. They are most commonly specified for use in test and burn-in ovens, along with communication systems, process control, medical equipment, instrumentation, and automotive R&D. These connectors can also be configured as a test cable for a PCB in the absence of a daughtercard. Connectors with 0.100″ centerlines are offered with from 4 to 60 contact positions, while 0.156″ centerline devices may be ordered with from 4 to 40 contact positions. The parts’ phosphor bronze contacts are provided standard with 10µ” or 30µ” overall gold over 50µ” nickel. Tail options include 100µ” pure tin or 5µ” gold. Additional specifications include a current rating of 3 Amps per contact, and an insulation resistance of 5,000 Megaohms minimum at 125 VDC. They may be ordered with tail (contact) lengths ranging from 0.100″ (2.54mm) to 0.560 (14.22mm), and with or without mounting ears.